Patrick Smellie notes two interesting details in the story. First, the irony that the “100% renewable” generator Meridian Energy had led the process of negotiating with Genesis. And second, that the public announcement of the shut-down by Genesis was probably just some signalling ‘code’ within the negotiations to get Meridian to share more of the cost of keeping Huntly as a back-up generator in the event of low hydro lake storage. Gareth Hughes, the Green Party MP points out that on the basis of generation of 1,277 GWh of energy in 2015, pulling the plug on Huntly power station would have lifted New Zealand’s proportion of renewable electricity generation from 79.9 percent to 84.5 percent. So unsurprisingly the Meridian-Genesis deal is just 180 degrees in the wrong direction in terms of the 90 percent renewable target and the need to reduce greenhouse gas emissions. Greenpeace has given us ten reasons to shut Huntly and have started an on-line petition to keep to the plan and shut Huntly. But what effect will this have on the Ministry for the Environment’s projections of energy emissions out to 2030? These are part of the December 2015 report “NZ’s Second Biennial Report under the UNFCCC”. This chart shows projected “with measures” emissions and “without measures” (i.e. business as usual). In the chart, the projected “with measure” emissions for each sector are the circles and lines. The projected ‘business as usual’/’without measures’ emissions are the lines between the data points marked by triangles on 2020 and 2030. That’s because the without measures projections are for only two years! It is almost as if they are an after-thought. The other thing to note is that for agriculture, transport and industry, there is no difference between “with measures” and “without” projections. This is of course because the Ministry is reflecting the Government’s intention to exempt those three sectors of the economy from any climate change policy. “Energy emissions are expected to increase between 2013 and 2015, but then fall between 2015 and 2020. The remaining coal-fired power plant in New Zealand is expected to be decommissioned by 2018, reducing emissions from coal. Coal-fired electricity generation is expected to be replaced mainly by a combination of hydroelectricity, geothermal, wind, and gas-fired peaking plants in the modelled scenario”. In other words, the ‘something’ was the close-down of Huntly. The Ministry for the Environment was relying on Genesis Energy to honour its public statement that it was closing Huntly. Which of course would then be attributed to the New Zealand emissions trading scheme. However it looks like the projections are now out-dated. 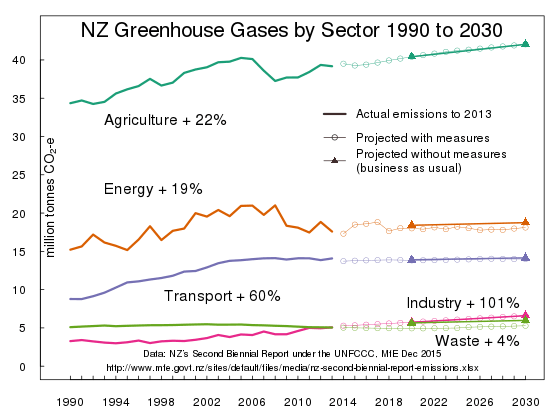 The 2030 emissions projections show that New Zealand’s climate change policies are intentionally not affecting three out of five sectors of the economy. With two power generators reaching a private agreement to keep the Huntly thermal power station emitting carbon dioxide for another four years, the projected savings in energy emissions out to 2030 have gone up in a puff of coal smoke. that’s just silly. There’s plenty of ways to cope with dry years. I bet Meridian’s thinking about re-negotiating Tiwai Point post-2018 and wants Genesis to stay on in the deal, and this is the only way they can get them to do it. On this rare occasion, I actually agree with Andy. I’m not convinced that the electricity market provides sufficient incentive to hedge against dry years or infrastructure failure and bottlenecks. It will get used sparingly, it is not a cheap generator. There are better targets, e.g. Fonterra’s use of coal to make milk powder. It’s not necessary to agree with me, I was merely repeating the contents of the Stuff article I linked to. Ohh and why are we expecting (already having) dry years. That`s right, 400 part/mill+. We may contribute `only .002% of world emissions` but we are not exempt from the effects of 1deg+ rise in global temps. Soooo give the alcoholic the keys to the brewery why don`t you. Closer to home we have Porirua. (Last year it was Capity Coast). Oh and while I`m at it a number of aquifers in Canterbury are apparently 4mtrs lower than ever before recorded leaving many occupants of the plains literally high and dry. Could it be that receding glaciers and depletion of high country snow (and lack of rain) are taking effect. The reason given for firing up Huntly was the `possibility` of low levels of the hydro lakes. So apparently we know what the problem is but will solve it by adding to it. But wait, there`s more. Captain Fantastic (Simon Bridges) in a shiny Lycra suite comes to the rescue with 65 thousand electric cars by 2025, powered by coal, (YEAH, RIGHT). Yes, ok I`ve had a couple of reds (sorry not yours Gareth) but hey tell me where I`m wrong. I think Hillary Clinton might be one that has received funding from ExxonMobil, and has also received some backing from the Koch Brothers. I don’t have exact details, but I’m sure the Trumpsters will provide all in due course. Trump denies climate science so does most of his fan base. Just listen to their propaganda. And yes Andy, the cancer of climate denial, science denial in general and corruption by industry interests and selfish behaviour is not limited to the deep morass of the “conservative movement”. At least, the Democrats acknowledge the problem instead of denying it. That is a significant difference. Oh and to add to that: The Republicans not only deny climate science, they actively and intentionally have conspired to derail, undermine and prevent meaningful measures to work towards a solution in the US and abroad. This active and intentional conspiracy is what is making them culpable and the day of reconning will come. Maybe Clinton gets funding from the Koch brothers Andy. Maybe not. You provide no evidence at all, so innocent until proven guilty. The majority of republicans (and conservatives) are in denial about AGW while the majority of democrats support AGW from various polls as below. The following article is a very interesting analysis of conservative and liberal attitudes to science in general and includes results of numerous polls. It doesn’t look good for conservatives. Andy: If…. “Donald Trump isn’t a conservative by any definition”…. then can you define please “what” Donald Trump is in your opinion? Donald Trump is a New York liberal in favour of Liberal policies like partial birth abortion, government subsidies, trade embargoes, etc. For genuine constitutional conservatives, who use the US constitution to promote individual liberty over government largesse, Trump has suckered his constituency. Trump is a funny sort of bird. He seems to have flip flopped from being quite liberal in the past, even left leaning, to rather conservative, at least on social and climate change issues. However I don’t care about Trump, as he is just one person. Note that the links in my post showed very large numbers of conservatives are sceptical of climate change, and also a surprising amount of other pretty basic science. I guess many conservatives in America just don’t get science, or get threatened by changing knowledge. Nigel, Trump has flip-flopped on many issues, but so do all the politicians. Most of them change their mind just to please the voters. Hillary Clinton is a case in point. Ted Cruz is a constitutional conservative and so it at least fairly consistent in that regard. Sanders, also was fairly consistent in his criticism of the elites that run Washington. In some ways, Sanders and Trump are products or the same problem – a political elite that has lost touch with its voter base. Much like the UK conservatives and the EU issue. The real problem is Andy, that the sort of people who vote for the US conservatives and / or Trump are the real culprits. They lost sight of reality when it comes to science. But I cast the blame not so much on them but on the smear artists and the forces in the Conservative and Libertarian movements who have deliberately poured sand the eyes of what they perceived to be their electorate and fanned the flames of stupid science denial to create the “movement” that they thought would be their power base. But the problem is that now they have created this mass of agitated right wing zealots who are ready for the 4th Reich…. I’m sure there is a bit more to the political right than the “4th Reich” as you describe it. I’m pretty sure most conservatives/libertarians/alt-righters/Cruzniks/Trumpkins/ also probably accept that there is more to the left than the Gang of Four. You might be interested in this article in the Guardian by Dana Nucittelli A href=”http://www.theguardian.com/environment/climate-consensus-97-per-cent/2016/may/04/scientists-are-figuring-out-the-keys-to-convincing-people-about-global-warming”>”Scientists are figuring out the keys to convincing people about global warming” Particularly fascinating are the results of an international survey in which Chinese respondents demonstrated most knowledge about the causes of climate change and most concern, while US respondents showed least knowledge by far and least concern. Germans and Swiss showed most knowledge of consequences of Climate Change. It appears basic knowledge is more influential for most than ideological positions. Noel, your first link (copy and paste into URL bar) works. Your second link in fact does not work. And yes, I second the need to get a comment editor back…. ! For once, Andy, and interesting paper cited by you. hmmm… not sure if I can support that climate change or global warming is contested among scientists. In fact, it is not contested among scientists as a happening and real and dangerous phenomenon, and its cause (fossil fuel CO2 emissions + land use changes) is not contested among scientists either. (Discounting a few “contrarians” in the pay of the fossil fuel industry or by libertarian think tanks). Further, the real reason that many people are still denying the reality of climate change and its causes is the fact they are continuously subjected to propaganda paid for and devised by fossil fuel interests, libertarian “think tanks”, propagated by right wing media, that is purposefully designed to prevent them from the ‘belief update’ that they might experience otherwise. And in many if not most cases, the original ‘belief’ that climate change is a hoax, a conspiracy or a scientific blunder was seeded by the same forces and methods in the first place. Such irrational ‘belief’ seems also to be part of the necessary ‘Proclamations of faith’ for somebody to belong to right-wing, ‘neo-conservative’ or libertarian political circles, which delays the pending belief update further while at the same time isolating these circles from the rest of the rational world. But I am sure that the mechanisms of weather observations in the age of growing extremes will eventually work their way as suggested by the paper in updating such irrational beliefs as more and more parts of the world experience rather palpable excursions from the “climate normal”. So why was this published in a paper from the Tyndall Centre? Why does the AR5 WG1 SPM state that there is no central estimate of climate sensitivity because of “disagreement”? Then you go on to claim that there is a massive propaganda campaign by conservative think tanks and fossil fuel interests. This is completely without foundation. Then without a hint of self-reflection, you and Noel drool over the latest spiral infographic that is basically a climate change propaganda tool. Interesting: the cracks are showing us a little of what it’s like inside Andy’s epistemic bubble. As everyone else knows, there’s plenty of interesting stuff being done and discussed on the details of the climate system and its response to increasing CO2, but there is no debate about the fact of warming or its continuation into the future. The “massive propaganda campaign” is becoming ever more clearly documented as the months go by. You may be in denial about that, Andy, but it is nevertheless real. As for the graphic, it rather tellingly points out just how warm the last 12 months have been in the historical context. You may regard that as propaganda, the rest of the world will take it for what it is – one of the signposts on the road to hell. Obviously I have a mental health issue or something, because the massive propaganda campaign seems to miss me. Neither of these issues were part of any propaganda campaign, other than the activists who falsely tried to link the issues to some climate angle. Since you live inside the bubble created by 30 years of propaganda, it’s hardly surprising you fail to acknowledge its existence. Nobody claims the Alberta fires were “caused” by climate change, but they were certainly made worse by warming, as Liz Kolbert explains in the New Yorker. As for the islands: the authors were at pains to point out that they were looking at how the loss of those islands would inform how we cope with rising seas in future. If some media got it wrong – well – the media gets a lot of things wrong. I agree with Thomas that American conservatives / republicans do seem in a state of delusion over climate change, and there is a think tank campaign to debunk the science. There are plenty of books / articles covering this with hard evidence that are easily googled, unless you are Andy and determined not to find them, or determined to pretend they don’t exist. However recent polling does show at least some conservatives and republicans are starting to see the light on climate change, and are less sceptical. Conservatives take a while to shift positions but often do eventually. I see this with people I know. For example some conservatives now solidly support gay marriage, just took them a while. Then then become some of the strongest advocates. I’m liberal, and it even took me a while to fully accept gay marriage. I think people add things up. We have seen increasing temperatures with the big spike last year, quite a few heatwaves and large scale storm events, and ice loss is now impossible to deny. I think people need to see strong temperature spikes, and real world changes, photos, etc rather than science that goes above their heads. Hopefully its not coming too late to do something about it. First of all, people do have different attitudes to climate based on their political and philosophical beliefs. Mike Hulme wrote a book called “Why we disagree about climate change” on this subject. The USA was founded on the principles of the US Constitution, a unique document that defines the relationship between the state and the individual. For this reason, constitutional conservatives (of which there are not many, as evidenced by the rise of the Liberal Trump) see a large state impeding on individual rights. There may be a massive propaganda campaign to “deny” science, but I don’t see it. If I need to search for propaganda, it isn’t very effective as propaganda. As I said: you’re in denial. The campaign has always been to derail or delay action to reduce emissions – and it has been undeniably successful. If there were compelling scientific reasons why we shouldn’t cut CO2, the usual suspects would have been pushing them for all their worth. Instead we get tired old hacks and professors emeritus trying to muddy the waters at every turn. A tactic you seem only too happy to adopt yourself. I don’t accept that conservatives don’t like regulation. Regulation is an enabler of business because it defines the boundaries in which one may operate. Trading standards are a good case in point, for example energy efficiency standards on fridges. In the early days of the USA, marriage was a common law contract between couples and their families. The Democrat party introduced a marriage licence to prevent inter-racial marriage. Regulation controls negative externalities. If CO2 causes dangerous, or even moderately deleterious environmental effects, then regulation is sought for. The problem is of course that the world has to all act in accord. … and meanwhile in Canada…. (and Indonesia, and….)…. I read it. It’s a model in the making, a group of hypotheses not at that stage tested against people. My own limited experience of people changing has had far more to do with some piece of data answering a question they have been pondering. However, I have witnessed people trying to equate temperature experience with the idea of warming which much of the Tyndal model seems to be addressing. This misapprehension of the relevance of immediate thermal experience has been much exploited by those who would sow confusion. Thomas, thanks. I actually pasted the link in the first post above to the second with the small tag correction needed at the beginning but those numbers that jumped on to the end are a bit mystifying. I have no idea where they came from. Rather effective I suspect. I plan to show it around. `I must have a mental health issue or something.` No `something` Andy, defiantly mental health issue. Wind yourself back say 50 yrs and consider what was the norm then. (No not your imaginary version that qualifies your picture of today). We had occasional extreme weather events, like fifty, hundred year frequencies. Fast forward to now and those events are far more extreme and far more frequent on a world wide scale. (That is UNDENIABLE). Regardless of the the scientific evidence that qualifies why that is so, that is a fact. In the stark light of day Andy your denialist days, and those of your like minded friends are history. Why, because the extreme weather events driven by an ever warming global temperature (as a result of 400 pts/mill and rising human contribution) will not go away any time soon. So seek therapy, do what it takes to get with the program to reverse the consumption of fossil fuels and give mine and your kids a chance of a future. At the moment you are part of the problem, defiantly not the solution and I don`t respect or thank you for it. Amen for that…. and the day will come, when those who not only refuse to be part of the solution but who actively work towards preventing, will face the music. I’ll take your point about the mental health issue. I can’t actually remember what the weather was like 50 years ago, but I was a little kid in a different continent back then. As for the Albertan fires, there are definitely indicators that arson was to play. I can’t say whether “climate change” had anything to do with it, but the data for the area appears to indicate otherwise. One key factor in the disaster was the NDP government’s decision to reduce the area’s forest firefighting budget by 80% and to cancel the aircraft that waterbomb the fires. Where there is Andy, there is a red herring. a) According to the Candian forestry minister $100 Million was spent over the past 4 years to improve firefighting capability. Recent operational budget cuts of some $5 million seem insignificant in comparison. c) The fire was so dangerous and unstoppable because hot and dry conditions that lasted for a long time and no firefighting resource can stop the advance of such a fire in these conditions. The conditions there spell doom in the long run for the borreal forests of Canda. Predictions are that the area will turn into a Savanna as global warming advances. And natural fire causes such as lightning will always cause fires. With these forests turnining into dry tinder boxes we will need to expect the worst for the region. But of cause for Andy and his friends from the “Climage Change Denial Education Trust”, all this is just a sick plotitical game. Stuck in the lonely bubble their reality denial, blame must be found somewhere else than the real reason for the disaster that we are bringing upon us. I’m still trying to get to the bottom of this, but the contract to use the large water skimming aircraft used to fight these large forest fires was cancelled before these fires. I’m not getting into an argument as to whether the fires were exacerbated by “climate change” however you define that, since it largely an unfalsifiable proposition. But at least give me the courtesy to accept that the firefighting budget cuts in Alberta (by the left wing NDP government of Rachel Nottley) is actually something that is an issue? I was once invited to apply for a Ph.D. on developing optimal strategies for placing airborne tankers in Ontario. The state is so vast and the tax base is insufficient to protect everywhere at once during these sorts of conditions. I find it astonishing that such conditions could possibly occur in May. El Nino is the primary cause, but AGW makes the conditions that much more extreme. The irony is that it was Fort McMurray that was affected. It sounds as if the oil sand (it’s really bitumen) mining infrastructure has not been that badly affected, but I can’t see how they were making money anyway. An economic and environmental disaster. OMG! I just looked out the window and we have plums on our plum tree! It flowered a few weeks back in mid autumn (usually mid spring) and now as we approach winter it has tiny plums. Poor thing – way out of kilter. Second to last day of Autumn and there are daffodils flowering…. The plums are still on the tree and getting bigger – and there is more blossom and leaves appearing. No really Thomas I believe Andy really thinks himself as a bit of an enigma, teasing us with his inane, (no insane) and seemingly ignorant posts. I think he`s watched to many Bat Man movies. Obviously he has to much time on his hands and no real purpose in life and lives only to generate attention to his person. I know this blog is about the science and associated data of climate change and Gareth being a free minded tolerant person has allowed Andy to participate but really he is a distraction but also a prime example of the denialist colonies that live out there in never never land and should be seen as part of the challenge of overcoming climate change itself. Can we get back to what this post is about. I am interested in what Cindy said. If this decision to keep Huntly open is linked to Tiwai point, then we have an aluminium smelter, with a dedicated hydro scheme attached to it for electricity, keeping a thermal power station running and messing with our emissions reductions policy. How crazy is that? Maybe a target for the #breakfree movement. Tiwai point is an interesting matter. Society will need metals going forward. Aluminium is a prime resource and necessary for many aspects of our high tech society. It has the edge over steel from an environmental perspective with the regards to CO2 as no carbon burning is required in smelting the Al from the Bauxite mineral. And here in NZ we could in principle use carbon emission free electricity for that process. I think NZ would be well advised to maintain its home-grown Al smelting capacity. What we need is more carbon-free electricity generation so that we no longer need Huntley as a backup. The argument is that if we lost the smelter we could close Huntley. Turned around: We prop up the smelter with Huntley as a backup. Therefore, if we had more non-fossil electricity generation (wind, solar, geothermal, tidal, hydro) the Huntley – AL smelter connection could be resolved. As Andy says, the global aluminium market will determine Tiwai Point’s fate. I don’t think that the NZ taxpayer should have a bar (ingot?) of propping up the profits of a multinational like RTZ – not when the surplus energy could be used to reduce prices for consumers, and increase the proportion of renewables in our generation profile. An aspect of this is that one of the market drivers is the increased use of metal recycling. IIRC 60-70% of US steel use comes from recycled metal. The same may be happening in the aluminium market. Previous Previous post: Did NZ Steel make windfall arbitrage profits from the ETS?